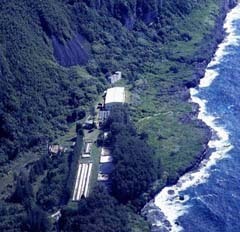 The Guam Aquaculture Development and Training Center (GADTC), also known as the Fadian Hatchery, is the largest and oldest aquaculture center in the Western Pacific. It was originally built as a private facility designed to produce fish and eel fry for the Asian market and was transferred to the Government of Guam in 1986 and to the University of Guam in 2001. GADTC serves as the vessel to accomplish UOG’s mission as the lead agency for aquaculture development on Guam. It strives to support aquaculture development on Guam and the Western Pacific through research, education, direct farmer support and service. The hatchery is a bio-secure facility on a five acre site, fully fenced on three sides and bordered by a rugged coast on the fourth side. It is only 15 minutes away from the airport by car. Facilities include an indoor hatchery with larval and artemia hatching tanks, a phytoplankton laboratory, a feed preparation room and a tool/work room. The facility also has both fresh and salt water supplies, an automatic generator back-up system, a separate office building, a duplex of two-bedroom living quarters and a refrigerated feed storage container. There are 14 concrete ponds on the site, including six 200 sq. meter Swedish ponds and four 200 sq. meter raceways. Numerous fiberglass tanks fill the area ranging in size from 0.5 to 20 metric tons. Current products of the hatchery include high-health (Specific Pathogen Free) shrimp post-larvae and brood stock, improved strains of tilapia fry and Claris catfish fry.